It’s the no. 1 cause of wrinkles. Protect your skin from sun rays firstly by staying indoors while the sun is strongest. Secondly get into the habit of wearing a sunscreen with a good SPF every time you go out. Apply it at least 20 to 30 minutes before stepping out in the sun and reapply it every few hours. Insufficient hydration is the second major cause of excessive wrinkles. In order to stay moist and elastic, your skin needs a constant supply of water. If you fail to get enough fluids in your body, cells will start to lose elasticity and eventually wrinkles shall start surfacing. Apart from the many well-documented ill-effects of smoking on the body, smoking also causes premature ageing of the skin mainly by reducing blood supply and nourishment to the skin. This makes the skin lose its elasticity and moisture. Also while smoking, some repetitive actions like squinting to protect the eyes from aggressive fumes and constantly dragging the cigarette fumes into his/her mouth causes wrinkles over time at the corners of the eyes and the mouth. When you don’t get enough sleep, the body produces excess cortisol – a hormone that breaks down skin cells. Get enough rest and you’ll produce more HGH (human growth hormone), which helps skin remain thick, more elastic and less likely to wrinkle. Make it a point to pay attention to the way you sleep. Sleeping on the side will create ‘cleavage’ wrinkles, since skin on that surface is being squeezed together. Those who sleep on the chest will most likely develop sleep lines on their neck, face and chest as a consequence of being crushed into the pillow throughout the whole night. To reduce wrinkle formation, sleep on your back. Consume a lot of vitamins that come from fresh vegetables and fruits as well nuts and seeds, which are all effective anti-ageing foods due to the amount of anti-oxidants they all pack. Stress causes creation of certain hormones like cortisol which decrease muscular tissue beneath the skin. This makes your skin thinner and make it look wrinkled and old. 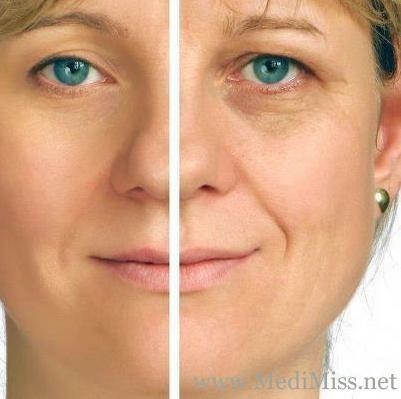 Many women these days are so concerned with anti-aging products they often overlook the power of a simple moisturizer. Skin that is moist simply looks better, so lines and creases are far less noticeable. Tap water strips skin of its natural barrier oils and moisture that protect against wrinkles. Wash them off too often, and you wash away protection. Moreover, unless your soap contains moisturizers, you should use a cleanser instead. If you’d like to use creams, lotions and various other chemical and surgical options (like peels, fillers, lasers and botox) to fight skin-ageing, it’s recommended that you visit your dermatologist who’ll guide you well. #Take 1 tbsp of cold milk and add 3-4 drops of lime juice. Rub this paste well into the wrinkles before going to sleep. The next morning wash with warm water and dry with a rough towel firmly. Once again rub in the cream - in the direction opposite to the wrinkles. Wait for ½ an hour and wash, avoid using soap. #Rub the pulp of a ripe Papaya on the face and leave for ½ an hour before washing. This is a very good toner also. #Rub almond oil on the wrinkles in upward strokes. Leave overnight and wash with warm water next morning. #Cut open a Vitamin -E capsule, add ½ tsp of glycerine and apply. Wash after 15- 20 minutes. #Add ½ tsp honey to 1 tsp rice powder. Smoothen the lines with this paste. Leave for ½ an hour and wash.
#Mix 1 tsp honey with 1 tsp of milk cream. Apply well. Wash after 20 minutes.